Why wait in line at the mall when you can get your photograph taken here!? 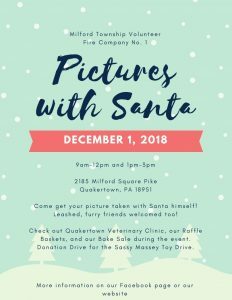 Bring your family, friends, and pets (Pets must be leashed) on Saturday, December 1, 2018 from 9am to 12pm and 1pm to 3pm. Doors will be open during this hour in between, but Santa will be taking a break. Our professional photographer Stephen Weidler will take your photo and it will be printed on site with a professional printer! 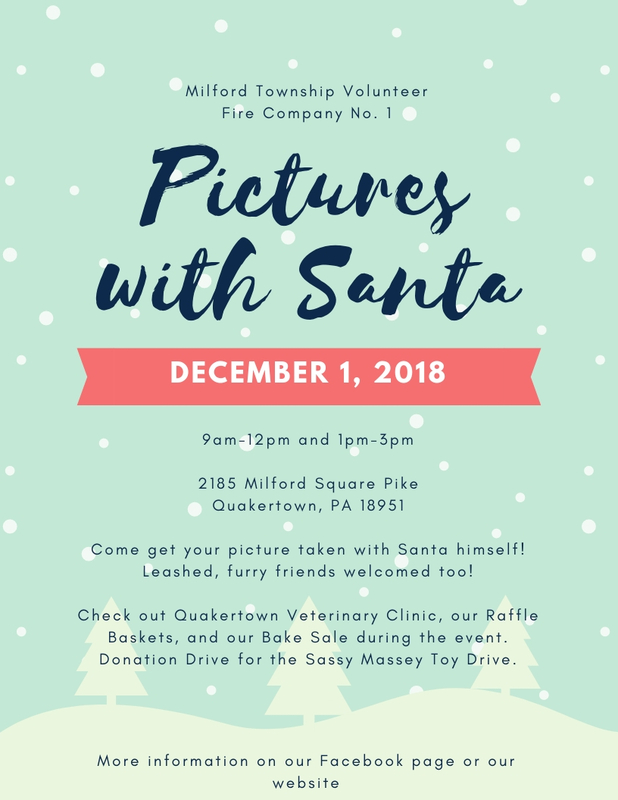 While you wait check out Quakertown Veterinary Clinic for information on what services they offer and browse by our Raffle Baskets and Bake Sale as well. During the event we will be holding a toy drive for the Sassy Massey Foundation which brings smiles to children in local children hospitals during Christmas! For every one acceptable toy donated you’ll receive five free raffle ticket for the baskets. Since these toys will be going into hospitals they need to be new toys (no used), no stuffed animals or anything with fabric, and no violent games or toys that promote violence. Suggested toys will be posted soon, please check the post on the discussion page of the event! If you have toys in question, please contact Cailyn Reinhard through Facebook or e-mail (cailynreinhard@gmail.com).